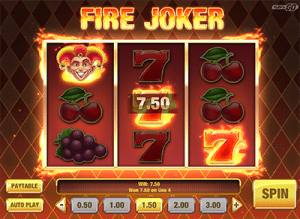 Fire Joker is a three-reel pokies game from Play’n Go which will change your opinion on three-reel games. While it draws inspiration from the classic liberty bell slot machines, there is nothing outdated or old-school about Fire Joker, with vibrant graphics, upbeat music and a couple of sweet bonus features to boot. Find out the best casinos to play Fire Joker for real money, how to play and more about this revolutionary 3-reel game. Play’n Go pokies are offered at several of our recommended online casinos, and you’ll find Fire Joker and other Play’n Go titles available at the trusted sites recommended in the casino table above. All of these sites are instant-play casinos, which means there are no downloads required to play Fire Joker or any other pokies as games are streamed directly over your Web browser (Safari, Firefox, Chrome, etc). Safe deposits are offered using secure, trusted payment options like Visa, MasterCard, Neteller, Skrill and Paysafecard. Fire Joker is available to play for free in demo mode at our recommended casinos, but if you want to play for real money all you need to do is sign up for an account and make an instant deposit using a trusted payment method. Register using our links and you’ll gain some exclusive welcome packages, including matched deposit bonuses and free spins. Play’n Go has utilised a nice simple game format in Fire Joker making it suitable for all players regardless of online pokies experience. This three-reel game has five set paylines, so all you need to do is select the amount of your bet by clicking the valued buttons at the bottom of the reels. Wagering options are varied, ranging from $0.05 to $100.00 per spin, making Fire Joker suitable for all bankrolls. Wild symbol – the joker is the games wild, which substitutes all other symbols to form a winning combination. Three jokers on a winning payline will award 80X your active bet. 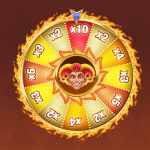 Re-spin of Fire – if two reels land on the same symbols but no winning combination occurs, you’ll receive a free re-spin to give you a second chance of forming a win. Wheel of Multipliers – fill the reels with the same symbols and you’ll get a chance to spin the Wheel of Multipliers, which is a Wheel of Fortune type bonus feature where you spin the wheel to win whichever instant prize you land on. The wheel is full of multipliers, with the highest possible bonus granting up to 10X your winnings. We don’t often see three-reel games released from leading game developers anymore, with software studios favouring the high quality animation and innovative graphics and bonus features which come from five-reel games. Fire Joker is a great exception, with Play’n Go releasing a three-reel game which won’t instantly be shunned by those who prefer the advanced video pokies. The graphics are crisp and vibrant, while the Re-Spin of Fire and the Wheel of Multipliers add some good winning potential. If you favour the classic, three-reel slots, this is the game for you, while it may even be a redeeming game for those who have crossed three-reel pokies off their list.